The cabins at Grand Mountain by Thousand Hills Golf Resort are tucked into the heart of Branson but are actually located in a secluded place surrounded by beautiful natural scenery and the spectacular rolling hills of the Ozarks. These cabins offer both luxury and comfort. Since the cabins’ inception, Thousand Hills believe that they provide the best cabin experience that can be enjoyed in and around Branson Missouri area. The staff and managers of Thousand Hills are hands on and are dedicated to providing luxury log cabin accommodation ever since, as the numerous awards and recommendations will attest. First time visitors to Thousand Hills are sure to appreciate of how the repeat visitors have enjoyed the best lodging experience for any vacation. The perfect lodging in Branson that you want to look for is waiting right here where you can enjoy unspoiled scenery, bountiful wildlife, the clean waters of the three pristine lakes, and many great outdoor activities. These cabins will give you a rustic natural cabin experience while bonding it with the luxurious and comfortable stay yet an affordable lodging in Branson and an accessible location right in the heart of the legendary Branson’s entertainment district. Lodging in Branson can be enjoyed best if you choose the cabins at Grand Mountain because Thousand Hills assures that the traditional respect and “Ozarks” hospitality will always be extended to every guest. Other benefit that you can enjoy at the resort is the chance to play the nearby 18-hole golf course, considered to be the most popular golf course in Branson and a highly awarded golf course in town where you will always receive preferential tee times and green fees. To enjoy a comfortable and convenient stay in the heart of Branson, choose the cabins at Grand Mountain as they offer soothing accommodations and elegant amenities. Every cabin accommodations at Grand Mountain features free wi-fi internet access, in-room stone fireplaces, indoor and outdoor pools, a sauna, fitness center, outdoor barbecue grills, an on-site tennis court, guest laundry facility, a gift shop and more. The beautiful location of this cozy cabin accommodation in a secluded place will let you experience the beauty and magic of the Ozarks for yourself. In this calm wooded area in the heart of Branson, the luxurious log cabins at Grand Mountain are available in a variety of sizes. Many of the cabins feature romantic settings, from one bedroom cabin to the larger two bedroom and three bedroom cabins that can sleep up to eight guests. All of these cabins feature a living room, dining room, and private porch that will let you enjoy the relaxing atmosphere as you sip your morning coffee. 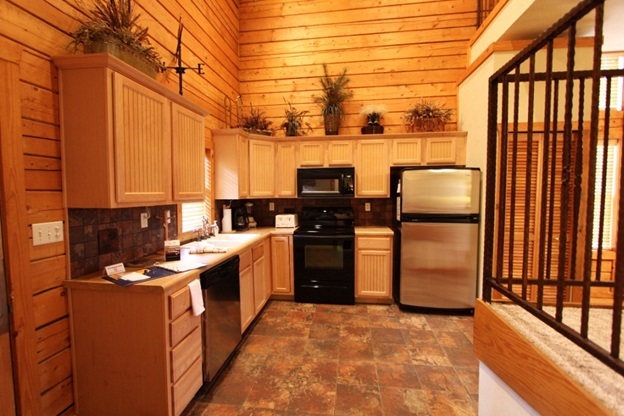 The kitchens of these cabins are fully furnished with modern appliances such as fridge, microwave oven, washer/dryer, pots and pans, dishes, and kitchen wares and utensils. So, if you think the best vacation requires the best lodging in Branson, stay at the cozy cabins at Grand Mountain by Thousand Hills Golf Resort.